Saturday sees the tenth anniversary of the smoking ban in England. A curse or a blessing depending on your point of view, July 1st 2007 was – for me – the day when the paternalism of the ‘public health’ lobby became overtly coercive. I was a smoker in those days, but despite quitting five years ago I still loathe this vindictive piece of legislation as much as ever. Perhaps it’s because it offends my principles, or perhaps because it has morphed into a vaping ban in many venues, but the smoking ban is the wound that won’t heal. The most obvious adverse consequence of the smoking ban was the destruction of a large part of Britain’s nighttime economy, as Rob Lyons has shown in his recent report. The anti-smoking lobbyists who claimed that the ban would lead to a renaissance for pubs have been strangely quiet on this subject since the ‘temporary’ drop in sales seen in the summer of 2007 (which was initially blamed on wet weather) turned into a permanent slump. Changing tastes? Cheap supermarket booze? Home entertainment? No doubt there are many factors behind the decline of these establishments. But tastes do not change overnight, whereas the collapse of Britain’s nightlife can be dated very precisely to midnight on July 1st 2007. It is no coincidence that the share price of the biggest pub chains peaked in June 2007 before going into freefall. They have never recovered, and whilst many venues have survived and some have prospered in the last decade, thousands of predominantly working class drinking establishments were dealt a fatal blow by the smoking ban. The number of closures speaks for itself but behind the closures there are millions of people whose lives have been made more miserable. Smokers who used to enjoy going to the bingo or drinking in the pub now play online and drink at home. Across the country, the social capital of whole communities has been drained. Many of the pubs that survived are shadows of their former selves, closing in the daytime and acting as ersatz restaurants in the evenings. The older regulars who used to prop up the bar in the afternoon are now in front of their televisions, alone. Secondhand smoke has negative externalities, or so we are told, but pubs have positive externalities which cannot be enjoyed by anyone, whether they smoke or not, when they are empty and soulless, let alone when they are closed for good. 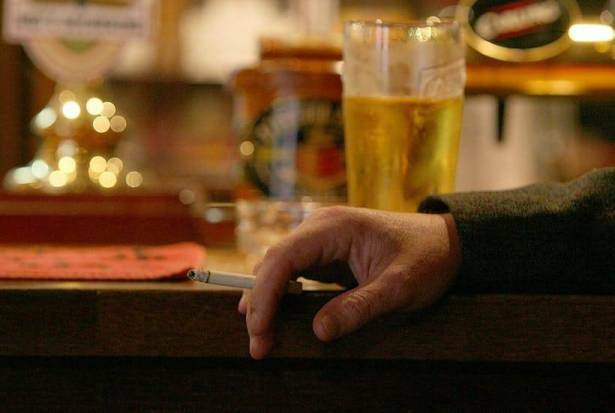 Barworkers might question the benefits of the ban when they are in a smoke-free Jobcentre Plus. And what are the benefits? The ban was sold to us with claims about secondhand smoke that were largely fictitious. Thirty years of epidemiology had produced dozens of studies, mostly looking at the health of nonsmoking women who were married to smokers, but they amounted to a mish-mash of weak and contradictory findings, with relative risks hovering around 1.0 (ie. nothing). If you closed one eye and squinted, some seemed to imply a slight increase in risk while others implied a slight reduction. The vast majority were statistically insignificant and the evidence on passive smoking in the workplace was even weaker. If passive smoking had not been such a useful weapon in the war against active smoking, epidemiologists would have abandoned this line of research by the end of the 1980s having concluded that there was noting to see. Instead, as Dr James LeFanu wrote in Panic Nation, ‘statistical alchemy’ was employed to ‘transform this sow’s ear of contradictory and anomalous studies into the silk purse of compelling evidence that would eventually compel the Labour government to ban smoking in public places’. My purpose in mentioning this is not to reopen the debate about passive smoking (anti-smoking campaigners angrily insist that the debate is over), but to note that the legacy of this ‘statistical alchemy’ still hangs over us. To justify smoking bans on the basis of harm to others, government authorities had to treat a carefully massaged selection of statistically insignificant findings from ultra-low risk observational epidemiology seriously. Put simply, standards had to be lowered – and they were lowered again when activist-researchers tried to justify smoking bans retrospectively. Once the bar of scientific proof had been dropped for the convenience of single-issue campaigners, it was difficult to raise it up again. Debased epidemiology made it possible to ‘prove’ that anything caused anything. The floodgates were opened for the junk science that is now the bread and butter of the ‘public health’ movement. Once the ban was in place, anti-smoking campaigners no longer had to pussyfoot around the paternalism that had always been its covert aim. By 2008, they were celebrating the (fake) news that ‘more than 400,000 people quit smoking as a result of the smoking ban’. A few days ago, the Guardian reported a claim by Public Health England that the ban had led to a reduction in smoking and a twenty per cent drop in smoking-related heart disease deaths. In fact, official data show that there was almost no reduction in the smoking rate between 2007 and 2012. Only once vaping became popular did the number of smokers decline. Whatever scientific fig leaves were used to justify the ban, it is not difficult to discern the true motives of its advocates and supporters. Anti-smoking campaigners wanted it because it made life more difficult for smokers, and a significant number of nonsmokers were happy with it because they did not like the smell of tobacco smoke. You, dear reader, may be in the latter camp. If you’re thinking of writing an angry comment below the line, don’t bother. I’ve heard it all before. I know you think that smoking is a filthy habit. I know you like the fact that your clothes no longer ‘smell like an ashtray’ when you come back from the pub. All I’m saying is that we didn’t need to make it a criminal offence to smoke in every single publicly accessible building in the country just because some people want to wear the same clothes two days running. In a liberal society, you can’t go around banning things just because you don’t like them. But if we’re honest with ourselves, that is what we did with smoking ten years ago. It normalised coercive paternalism and validated the tyranny of the majority. This, I would argue, is the smoking ban’s most pernicious legacy. This is an extreme example, perhaps, but his basic point has been echoed by any number of campaigners for paternalistic prohibitions. The smoking ban unleashed some ugly impulses in the British character which get worse every year. But Professor Seedhouse is right. Either you allow free choice or you don’t. As consumers of alcohol, sugar and e-cigarettes are starting to discover, you really can’t have it both ways.